BIMobject®, a leading solution provider to the worldwide construction industries with its cloud based BIM products of manufactured building and interior, just declared the availability of the latest version of the BIM object cloud assimilation app compatible with Autodesk Revit. The BIM professional can download this BIM application from Autodesk Exchange Store. The Revit users can access this application at completely free of cost. The Revit users can avail a toolset to discover, supply, update and verify BIM objects delivered through the BIMobject® Portal and incorporate them with their BIM software. It is the first ever top-notch web service incorporation within Revit. The App contains various functions through which the revit users will be able to search through the BIMobject® Portal online quickly and get real products from real manufacturers. The Revit users can easily download, place and configure these BIM objects in their project. A simple click to download and the BIM objects are loaded in the Revit user’s project, ready for placement and further configuration. Fully redrafted and optimized for the most updated version of Revit. 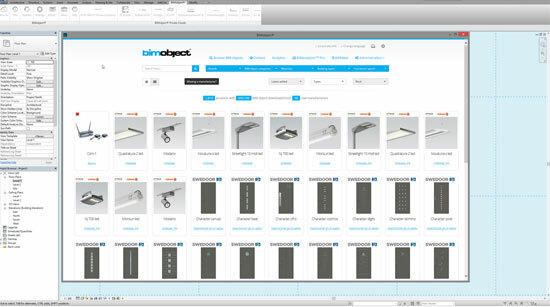 Facilitates the new BIMobject® Portal GUI (HTML5). Test out product information updates. Support updates in the BIM objects properties and include new properties. Incorporated BIMail™ share information with manufacturers within the BIM software. Branded App icons connnecting manufacturers Private Clouds. Incorporated news and help functions. The BIMobject® App 2.0 for Revit is well suited with Autodesk Revit 2013, 2014 and 2015.